Much praise has been showered on first responders, and it’s well deserved. Companies big and small are giving time and resources to relief efforts. The floodwaters have started to recede in most areas, but the hard work is far from over. We and others will be rallying to support victims and helpers for some time; some heroic stories have been told and others have yet to happen. Here, we’d like to celebrate a couple of efforts we’ve heard about. There will be more, and that’s a testament to our communities that we can all be pleased to know. It’s a heroic act that is one of many, but her effort is one that has, justifiably so, garnered great attention. Domesti-PUPS veterinary partner, Nebraska Animal Medical Center, is selling branded T-shirts for $20 with all proceeds being donated to flood victims in Nebraska. Stop in to the clinic to get yours and show your support! 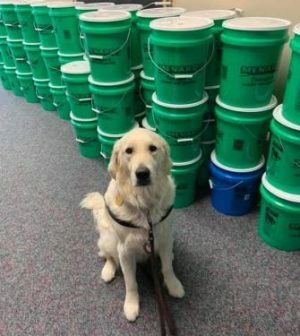 Cisco, a Domesti-PUPS service dog in training, and weekend warrior volunteer Rhonda Obermier, help fill buckets of cleaning supplies for Nebraska flood victims at Good Shepherd Presbyterian Church. Good Shepherd is a collection site, you can donate items by calling them at 402.484.8844. 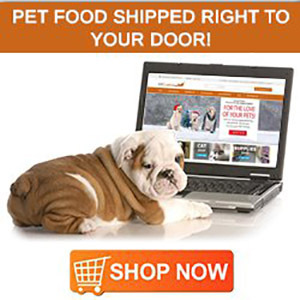 Domesti-PUPS received pallets of dog food samples from local dog food manufacturer, Nature’s Variety. Our board asked if we could then donate the food to the pets in need in the flooded communities. “When we are out of food, other organizations are quick to assist,” says Domesti-PUPS Executive Director Michelle O’Dea, “While we do not have kennel space to house displaced pets, this is just one way we can pitch in and help our neighbors.” Domesti-PUPS sent 1,000 pounds of dog food to help our canine friends on and near the reservation. If you would like to assist our friends on the reservation, click below for ways to help, and a list of needed items. Thanks to the “Hamburg Helper” and Domesti-PUPS for these rescue efforts. Stay tuned to Pets in Omaha for more coverage of the floods and its stories. Have a story you want to share? Find our contact page here or let us know on Facebook here.